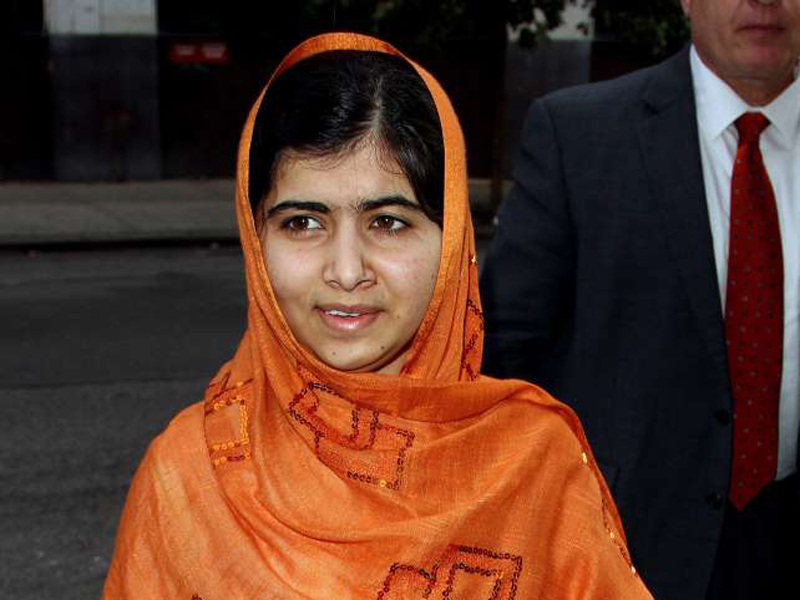 Malala Yousafzai arrives for an appearance on "The Daily Show with Jon Stewart on Tuesday, October 8, 2013. A U.S. drone strike killed the leader of the Pakistani Taliban, who ordered Yousafzai's assassination. A U.S. drone strike killed the leader of the Pakistani Taliban, Mullah Fazlullah, the elusive militant who ordered the assassination attempt on then-schoolgirl and future Nobel Peace Prize winner Malala Yousafzai, Afghan and Pakistani officials said Friday. Afghan defense ministry spokesman Mohammad Radmanish said that Fazlullah was killed along with two other militants and a driver when their car was struck in the eastern Afghanistan province of Kunar, along the Pakistani border, shortly after midnight Thursday. A Pakistani intelligence source confirmed the report but said that a total of five people were killed. Fazlullah was buried within hours in Kunar, said the official, who requested anonymity because he wasn't authorized to speak to the media. U.S. forces in Afghanistan said they conducted a strike targeting "a senior leader of a designated terrorist organization" in the border region Thursday but offered no additional details. The Pakistani Taliban did not immediately comment on the reports. Fazlullah was an inveterate militant who was also believed to be responsible for the 2014 attack on an army-run school in Peshawar, Pakistan, that left more than 130 children dead. He also helped preside over a reign of terror in Pakistan's Swat Valley for years, ordering his men to kill and mutilate anyone who he believed opposed his extremist interpretation of Islam. "Mullah Fazlullah's death is huge news," tweeted Omar Waraich, deputy South Asia director for Amnesty International. "He terrorized the Swat Valley, ordered the assassination attempt on Malala, killed barbers, DVD (shop) owners, dancing girls, Sufi mystics." He was best known for directing the shooting of Yousafzai, an outspoken activist for girls' education, as she sat on a school bus in Swat in 2012, when she was 15. She and two classmates were shot but survived, although she had to be transported to Britain for treatment after a bullet lodged in her head. In 2014, she won the Nobel Prize and earlier this year she made an emotional return to Pakistan for the first time since the shooting.